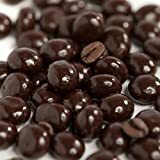 Chocolate covered espresso (coffee) beans are a popular candy that contains natural caffeine. Espresso beans are just coffee beans that have been darkly roasted. The caffeine content in coffee beans can vary depending on many factors and including the chocolate, 7 mg is the average amount you could expect to find. 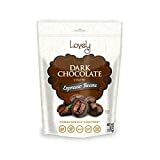 Chocolate covered espresso beans would range between 5-10 mg for milk chocolate covered and 6-11 mg for dark chocolate covered. 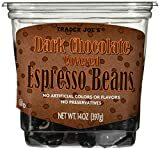 While this may not seem like a lot of caffeine, these little candies are quite addictive and it's easy to eat a lot of them in one sitting, so beware. espresso roasted arabica coffee beans, milk chocolate, and confectioner's glaze.